A small number of cases of Cushing's syndromes associated with prostate cancer has been reported. Ectopic adrenocorticotropic hormone secretion has been reported in patients with prostate cancer (Haukaas et al. 1999; Rickman et al. 2001). Tumors arising outside the lungs and secreting adrenocorticotropic hormone have histological features similar to carcinoid or small cell lung cancer. Clinically, patients may present with a variety of signs and symptoms, including round facies, proximal muscle weakness, obesity (mainly truncal), thin skin, easy bruising, purple stria, psychiatric symptoms, hypertension, and diabetes. Although no single sign or symptom is sensitive or specific enough for the diagnosis, when a patient presents with a combination of proximal weakness, thin skin, and any of the other signs noted above, a biochemical evaluation should be pursued. (Fig. 14.2). 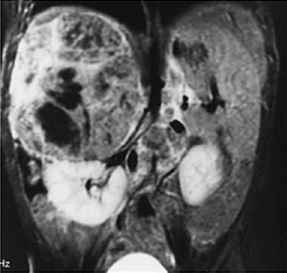 When the ACTH value is twice the normal value, the diagnosis of ectopic ACTH syndrome is likely. Management of the ectopic ACTH syndrome involves identification of the source of its production and treatment of the underlying cause (Goldfarb 1999).